Olbia has one or two important sights within the town, and its small historic core is a pleasant place to amble and to sit at a restaurant or bar. The town isn't expensive, and it makes a good base for a day or two - perhaps longer, if you are planning to take a boat trip, visit beaches or explore nearby sights. If you are travelling to or from Olbia Airport, it is certainly worth considering spending a few hours in the town itself. The enigmatic Nuraghic culture of Sardinia - a Bronze-age people building in stone but leaving no written records - has left many traces around Olbia, some of which can be visited. The Phoenicians were probably the first to develop a settlement and port on the site of Olbia, subsequently occupied by the Greeks and Carthaginians, then conquered by Rome. Roman Olbia was attacked and its ships burned in the harbour by the Vandals in around 450AD. 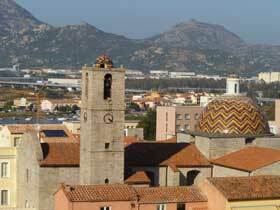 When Olbia finally rose from the ashes it was under a new name, Phausania, in a Sardina ruled by the Byzantine Empire. Later, in a period of self-rule by Sardinian regions, Olbia was a local capital and known as Civita. Next came Pisa, which founded a colony on the site of Olbia, and called it Terranova, a name which was retained through Aragonese rule and up until 1939, when Italy's fascists sought to recapture past glory by re-christening towns with their ancient names; Terranova returned to its Greek name Olbia. 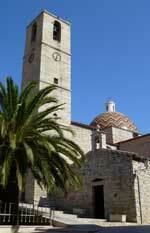 Olbia's important tourist sights are quickly enumerated: two churches and an archaeological museum. The town lies on the shore of a large bay, with a road separating the town from the harbour. Olbia's historic port, in use since pre-Roman times, was in this area, but nowadays the main ferry port is on an island in the bay, connected by a causeway to the town. Olbia's central core is based around Corso Umberto, a lively shop-lined street leading uphill from the waterfront. At the top of a low hill, it opens into Piazza Margherita, a kind of low-key hub of the city. Around this heart there are several attractive narrow lanes lined with old stone buildings, and a few yards from Piazza Margherita, another attractive little square, Piazza Matteotti. 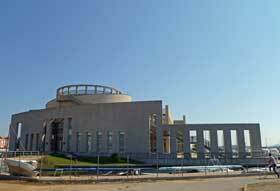 Olbia's important archaeological museum - Museo Archeologico - was first conceived in the 1980s, but has been a work in progress ever since. When we visited, it still felt rather incomplete, but there was a fair quantity of interesting exhibits, and admission was free. The museum and adjacent mainland roads are on the site of the Roman harbour of Olbia. At the beginning of the twenty-first century the remains of 24 Roman and medieval ships were found here, some probably vessels sunk during the sacking of Olbia by the Vandals. Restoration is a slow business, but when we visited two of the ships and a smaller medieval vessel were on display on the museum's ground floor, the relics including an 8m high Roman mast - a rare survival. Accompanying videos explain ancient ship construction techniques and provide a dramatic, film-trailer-style account of the Vandals' arrival. If the ships are not visible when you visit the museum, ask at the information desk - we were allowed in on an escorted tour. Other highlights in the museum include a small bronze boat from the Nuraghic era, a head of Hercules which was found in the sea, some fine Roman decorated glassware, an incense burner depicting musicians riding a camel, and a small gold cross. Check the museum's latest opening times on your arrival in Olbia - you may find it closed for several hours in the afternoon, and at weekends. There's a tourist information point on the roadside by the harbour near the archaeological museum; we picked up some useful information about Olbia and the surrounding area - especially its archaeological sites - at the information desk in the museum. One map which was freely available contained useful Italian and English descriptions of sites, beaches etc. along with bus route numbers for those reachable by public transport. Just off Corso Umberto, the Chiesa di San Paolo, a church built on the site of an ancient temple, has an attractive multi-coloured dome and a handsome stone exterior belying its relatively recent date (1700s). Modern frescoes inside celebrate popular recent saints and religious figures including Padre Pio and Pope John Paul II. 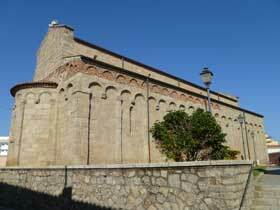 Olbia's other significant church is just outside the heart of town, a short walk beyond Via Mameli. The Basilica minore di San Simplicio (unreliable opening times) is a Romanesque granite church dating back to the eleventh century, which contains some historic frescoes. Other spots worth seeing as you stroll around Olbia are the town's market square, Piazza Mercato, covered by a modern roof, and a couple of traces of Olbia's ancient past: a stretch of the town's Punic walls, in a housing area between Via Aquedotto and Via Torino, and an exposed stretch of ancient paving outside the Municipio (Town Hall) at the harbour end of Corso Umberto, optimistically identified as the Roman Forum. After these tourist sights, Olbia's main charms lie in its laidback squares and its evening passeggiata, the good choice of reasonably-priced restaurants and pizzerias on the central streets and the opportunities for excursions. The town's setting too, is an attraction if you find a good viewpoint (we appreciated the view from the roof terrace of our hotel, the Panorama). The irregular bay, islets and the dramatic steep island of Tavolara offshore, along with the distant hills around the city, make a lovely setting. In the summer months it is possible to explore the coast and Tavolara island on day-long boat excursions from nearby resorts. Enterprising daytrippers could travel as far as the Maddalena archipelago off the northern coast, travelling by bus to Palau and then taking a ferry. On Corso Umberto and signposted down smaller lanes nearby there are many welcoming, unpretentious places to eat. Although often aimed at tourists, with tourist menus and English translations, most of the restaurants are not expensive - walking a few yards down a side street will bring you to the better, cheaper options. Da Paolo is a welcoming trattoria serving local specialities on Via Garibaldi, and the Antica Trattoria Pizzeria on Via Terme is a very popular, lively restaurant-pizzeria with an outside patio and a marvellous antipasto buffet. Around Piazza Matteotti and down at the waterfront end of Corso Umberto there are some pleasant cafe-bar tables for sitting with a glass of local wine and watching the promenading locals and visitors during the passeggiata. The area around Olbia is most easily explored by car. Sites of interest include the ruins of a Roman farm at S'Imbalconadu, a 'Giant's Tomb' Nuraghic grave site at Su Monte de s'Ape and a ruined hilltop castle called the Castello di Pedres. Beaches are accessible both to the north and the south of Olbia, some connected to the town by public bus services 4 and 5. 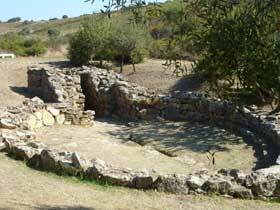 Happily for visitors relying on public transport, one of the most interesting archaeological sites in the area can be visited easily by local bus from Olbia. Bus number 4, from Via Mameli - near the level crossing, on the town centre side - runs out to the seaside at Pittulongu, a trip of approximately 20 minutes. This bus stops, halfway through the journey, right by a Nuraghic archaeological site, a sacred well known as the Pozzo Sacro di Sa Testa. Ask the driver to tell you where to get off. It's advisable to plan your visit around bus timetables as services are irregular and are heavily reduced in winter. The archaeological site, in a green pocket of countryside alongside a main road and big commercial superstores, is an interesting and atmospheric spot. The well dates back to the later Bronze Age, and is composed of three spaces - an outer circular area with benches, where devotees or supplicants could gather for rites and ceremonies, a vestibule with shelves for offerings and gifts, and the well itself. The natural spring is enclosed by a stone building with a collapsed dome roof. Seventeen stone steps descend down into the water, allowing for easy access by a priest whatever the water level. A drain channels away any overflow. When we visited, admission was free and a highly-informed guide showed us around and explained the history of the site; we were the only visitors. There is car parking at the site, an information desk, benches to sit on and a drinking water tap. After visiting the site, by catching the bus in the same place you can continue onwards to the seaside, to beaches at Pittulongu or Bodas. 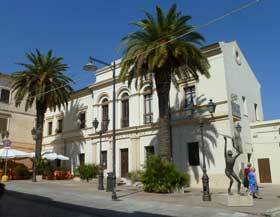 Most visitors to Olbia will be travelling through town en route to or from other Sardinian destinations. This north-eastern part of Sardinia contains some significant tourist destinations, both on and off the beaten track. The Costa Smeralda, a chain of famously expensive modern seaside resorts, is just to the north, while beyond the glamour lie some less pretentious towns and islands, where you can still - outside August - find romantically empty sandy beaches and turquoise waters. Either by car or by bus it is easy to reach the north coast of Sardinia, with resorts like Santa Teresa Gallura and Palau, the ferry departure point for La Maddalena island. Olbia's airport - called Olbia Costa Smeralda - is just outside town, and it is connected with the town centre by urban buses operated by ASPO, as well as longer distance services, some of them functioning only in the summer months. The main bus stops in central Olbia, used by airport buses, are just outside the centre, on Via Mameli. The stops in either direction are close to a level crossing where a railway crosses a road junction. Some ARST bus services (including the bus to Palau and Santa Teresa) stop around the corner on Corso Vittorio Veneto. To reach the heart of town from the level-crossing junction, take Corso Umberto, a shopping street leading gently uphill. This leads up into Piazza Margherita, a pleasant little square lined with cafes and shops. Corso Umberto continues ahead, leading down to the harbour and archaeological museum. ASPO run a number of routes in and around Olbia; their timetables can be checked online (see links panel). Tickets, costing 1 euro and valid for 90 minutes, can be purchased from a machine in the airport arrivals hall, and in Olbia at Adela Cafè by the bus stops, a tabacchi shop in Piazza Margherita and other businesses. You can also buy tickets from the driver, but these will cost more. The railway station in Olbia is near the centre - on leaving the station, walk up Via Pala onto Corso Umberto and continue to reach Piazza Margherita. Olbia's port is on an island linked to the town by a long causeway. Car ferries connect Olbia with mainland Italian destinations including Genoa and Civitavecchia, near Rome. ASPO bus number 9 connects the port with the town; cruise ship passengers may find special free shuttles provided. Some long-distance ARST buses and some trains serve the port island, called Isola Bianca. More ferries sail from Golfo Aranci, a port to the north of Olbia. Olbia has several decent hotels in the town centre, which are convenient both for sightseeing and for transport connections. There are also some out-of-town options along main roads and close to beaches, which would be suitable for travellers with cars.